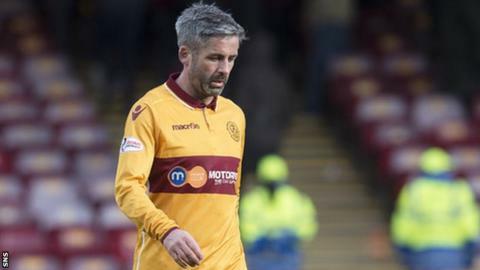 Motherwell captain Keith Lasley has defended boss Mark McGhee in the wake of the 5-1 home defeat by Dundee. Well have lost four in a row, conceding 17 goals in that run, leading to fans protesting against McGhee on Saturday. "It was because again we couldn't defend our box and never competed well enough - that's our responsibility." The Fir Park outfit were recently beaten 7-2 at Aberdeen and were missing regular defenders Stephen McManus, Steven Hammell and Richard Tait against Dundee. McGhee was keen to protect his players after the latest heavy defeat, insisting it is up to him to find a way to snap the losing run. But Lasley said: "The players take responsibility and it's up to us to build that trust with the fans again. "I'm telling you it is the case - we are not in this run because Mark McGhee has got it tactically wrong. "The manager can put us out in any sort of shape - at Aberdeen we could have been in any shape and wouldn't have won that game - it's the players, individually against your opponent and collectively, and that's what we're not doing at the moment. It's up to us top change that." Lasley, 37, was on the bench for the Dundee defeat and had no complaints about the manager's selection. "Any player that's not playing is frustrated but there's a bigger picture here and it's not about whether I was out there," he said. "I was involved in the 7-2 defeat at Aberdeen so don't worry about that, I'm as responsible as the next player." And the midfielder retains belief that Well, who are now third-bottom of the Premiership, just two points above second-bottom Inverness Caledonian Thistle, can move back up the table. "We know the league is still tight and we came out of the game thinking it's a relegation battle, which it is, but we still feel we are capable of going and winning a game of football on Saturday," Lasley said. "What we have got, I think, is two of the best strikers in the league [Scott McDonald and Louis Moult], and if we give them enough service they will put the ball in the net."